The CAA read The Gospel in the Marketplace of Ideas: Paul’s Mars Hill Experience for Our Pluralistic World by Paul Copan and Kenneth D. Litwak, as part of Apologetics 315’s weekly Read Along program. This took place August through October. Each week, an audio introduction from Paul Copan was provided for that week’s chapter, along with a brief synopsis and study questions. We were also able to connect with other readers in the comments on Apologetics 315, or on the Christian Apologetics Alliance Facebook page/group. After having given it some time to blend flavors, I am now prepared to give my thoughts on the book. These were my initial thoughts before starting the Read Along. Note that this review does not go through the book by walking through it from beginning to end, due to its reuse of or expansion on the same material at different parts of the text, rather than keeping similar topics together. We will let the reader decide if that is a format they prefer to read. For me, it felt kind of scattered. Copan and Litwak begin with a nice sketch of our current cultural landscape as being multicultural, relativistic, secularized, and post-Christian. They define a worldview as a philosophy of life that reflects a deeper heart commitment and answers questions like Why am I here? Why does anything exist at all? What am I to do or think? How can my life have any meaning? Later they define worldview as “an articulation of the basic beliefs embedded in a shared grand story that are rooted in a faith commitment and that give shape and direction to the whole of our individual and corporate lives.” They lay out the problem: Most people today, even those calling themselves Christians, only know a caricature of Christianity, so that if ever they come into conversation with a knowledgeable Christian, a lot of what the Christian communicates is filtered through a faulty worldview and so is lost in translation. The first hurdle to overcome is to make sure we know what their worldview is, including their view of Christianity, so that we speak their language and nothing is lost in translation. We are the ones with a message to deliver, and so we are the ones who need to learn how to speak their language—not the other way around. Paul’s Mars Hill address in Acts 17 is suggested as an excellent New Testament example of doing just that. In order to see what a great example it is, we need to learn about the world in which Paul evangelized. First, the Athenians took Paul to Mars Hill (Areopagus) because that was where they took people teaching a new deity, in order for the council to legally approve it. Copan and Litwak give the history behind the meaning of Areopagus (Mars Hill), the juicy details I will leave for them to tell. They answer what may be to many a surprising objection (it was certainly news to me), that some scholars (like F.F. Bruce, William Ramsay, Ralph P Martin) think Paul’s speech on Mars Hill was meant to be presented by Luke (the author of Acts) as a failure in terms of response and strategy. They felt Paul experimented with contextualization, but it failed to get much of a response, so he switched tactics with the Corinthians and rejected philosophy (but note his mention of evidence and eyewitnesses in 1 Corinthians 2), sticking from then on to the bare gospel. 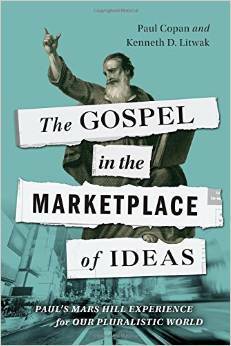 However, Copan and Litwak say that is an argument from silence and refer to Paul’s Areopagus speech as a Christ-centered strategy for cross-cultural, cross-worldview communication (one Christian philosopher’s phrase for apologetics—the defense of the Christian faith in the marketplace of ideas). Paul confronted the Corinthian church’s arrogance and spiritual one-upmanship—his confrontation was not meant to be against rational argument or the use of the mind. Paul also built bridges the same way before and after Athens, reasoning and persuading (dialoguing, not just preaching) in the synagogues and the marketplace, and referring to the witness of God in creation. Paul’s approach in Athens illustrates 1 Corinthians 9:19-27. Copan and Litwak note that 1) Luke shows Paul masterfully navigated the protocols of introducing a new deity in Athens, 2) the genre of Acts is Hellenistic historiography (a blend of facts, good literary style, and rhetorical skill), 3) the speeches in Acts were summaries because they only take a couple minutes to read (Paul put Eutychus to sleep with his well-known lengthy preaching, and Mars Hill was no occasion to avoid extrapolation), 4) speeches quoting Scripture were reserved for Jews, whereas speeches to Gentiles quoted their own poets (though reflecting biblical themes), 5) Luke’s mentioning that Paul’s message received a mixed response is not an announcement of failure but of success to be imitated. Note that the Jews also gave Paul a mixed response. “He received a mixed response at Corinth and a mixed response when preaching to prominent Jews in Rome” (Acts 28:24-31). A very small number was converted in Philippi (thwarted by businessmen). Thessalonica and Berea responded okay, but they resulted in no mega churches. The Macedonian reception was small, and Athens was no different. Paul notices that only a minority of converts are intellectual elites, but a) never says to ignore them, and b) does not ignore them himself. Consider the reception Jesus endured on the cross, and most of the disciples endured at the end of their lives. Luke offers two speeches in Acts that provide two different approaches for non-Christian audiences with no biblical frame of reference: Lystra (argues from nature), and Mars Hill (quotes poets). The apostles didn’t give the identical message every time they spoke, because a different audience/situation calls for adaptation. Paul’s education equipped him to adapt to the audiences of his day. He was from Tarsus and so could dialogue with cultural elites. He was a well-educated Jew who learned under Gamaliel, and so could converse with Jews. And he was a Roman citizen, and so could relate with Gentiles. Athens was such a religious city that it even had altars dedicated to unknown gods, to avoid offending a god they failed to recognize. Athens was also a major center of intellectual and cultural achievement, giving us Zeno, Epictetus, Epicurus, Aristotle, and Plato (etc.). Platonists considered physical resurrection to be a negative thing because they viewed the body (all things physical, really) as a corrupt prison from which death released them, so they only sought spiritual immortality through the pursuit of wisdom. Part of the Athenian culture was the Epicurean goal of pleasure through wisdom and absence of pain or soulful trouble; they did not believe the spirit survives the body. Stoicism asserted God is a pantheistic Logos (or cosmic reason), deprived the body, and prized the divine spark which returns to the Logos at the body’s death. In Athens there were Jews, polytheists, and philosophers. Copan and Litwak include lots of juicy details about how each of these groups would have received Paul’s words. Copan and Litwak set out to demonstrate #1 from above: Paul’s rhetorical prowess at the Areopagus. He was no “foolish babbler.” (By extension, we can conclude the same about Luke, since he authored Paul’s Mars Hill retelling!!) He begins with a traditional compliment, by praising them for being very religious, using a word the philosophers would take to mean superstitious. He rhetorically appeals with one worm to birds of different feathers. Through Acts, Luke is providing instruction on how to dialogue with the intellectual and social elite. Though Paul is grieved by the idolatry surrounding him, he doesn’t let it show. We then go on a lengthy sidebar discussion about monotheism, natural theology, and correcting caricatures. Paul corrects Athenian misconceptions by pointing out God has no need for temples, and he is near. He uses natural theology, relying on facts of creation and human existence to point to God. He uses Greek philosophical terms [like theion (divine nature) rather than theos (God)], but all to convey biblical truths, not affirm Stoic ideology. Copan and Litwak note that some in our day are “apatheists” who just don’t care one way or the other, and then they highlight how Paul appeals to their poets who call us God’s offspring. This is a demonstration of Paul’s knowledge of their culture’s appreciation of quoting authorities—the older the better—as a form of proof. (Aside: The poetry bit is why the field of Imaginative Apologetics is so promising.) He also refers to eyewitnesses of the resurrection in 17:31. In that culture, more weight was given to eyewitness testimony than written historical accounts. He begins where his audience is, using their concepts and terminology, but delivering the whole Gospel. However, it is at this point that I stopped and asked… Why doesn’t Paul tell the Athenians Jesus died to atone for our sins? In other words, God overlooked past sin (ignorance), but now that he has made himself known, it is time to turn to him. There is judgment for those who reject his overlooking. This overlooking, and this judge, are both proved by God resurrecting the judge from the dead. This also helps make sense of every other instance of a call to repentance before and after Jesus died and rose again. It used to confuse me why John the Baptist was essentially carrying out the Great Commission before Jesus even died for our sins. It also used to confuse me that there was such a heavy emphasis on repentance before and after the work Jesus did on the cross—aren’t we saved by grace through faith? First: God is unchanging, and so is his love. He did not start loving us the instant Jesus said, “It is finished.” Jesus came to us because God so loved the world (John 3:16), not the other way around. Jesus’ sacrificing himself for us on the cross was God’s love incarnate. There is no knowing that incarnate love without repentance, without turning back to the God that saves, who sets free from the slavery of sin to the knowledge of his unconditional love. So repentance into freedom is important, and it isn’t just something we do once when we recite the sinner’s prayer. He cannot die for our freedom again if we turn away from him back into slavery—once was enough to demonstrate his unchanging, unconditional love (Hebrews 10:26). We either accept him and live as loved sons and daughters, or we don’t, and live as judged slaves. Paul is saying that the one thing we cannot do, now that God has demonstrated his over-looking love, is live as ignorant. I think Copan and Litwak are right that the Athenians took pride in their heritage of being lovers of wisdom. But I think, just as with the “compliment” about being religious/superstitious, Paul’s use of “ignorance” had two meanings. On the one hand, he is saying their altars to the unknown gods betray that they are not as wise as they esteem themselves. On the other hand, he is saying that God has revealed himself enough now so that they know what they need to know in order to repent from their ignorance/wrongdoing—ignorance is no longer an excuse. Copan and Litwak say that Paul is not saying Paul’s God is the “Unknown God” they worshipped with that altar, but I think that is a matter for debate. In “Eternity in Their Hearts,” Don Richardson suggests Paul is actually saying that very thing, and that there is good reason to believe Paul knew the story of Epiminides and his “agnosto theo”—he quotes Epiminides’ poetry! Copan and Litwak do highlight that the speech is likely a summary, but also that Paul is proclaiming the full Gospel to the Athenians, “the good news about Jesus and the Resurrection” (Acts 17:18). It is why the Athenians think he is teaching strange deities (plural) and take him to Mars Hill to justify it to the council. They mistake the Resurrection (Anastasis) for a deity. In his speech on Mars Hill, he made it very clear that he was speaking of Jesus’ resurrection. I very much enjoyed chapter 6’s emphasis on Greco-Roman views of the afterlife and how different audiences present at Mars Hill would have received Paul’s talk of the resurrection. I also enjoyed how Copan and Litwak show that Luke presents Paul similarly to how Plato presents Socrates in The Apology (see page 38). One question I am left with: Did Paul only refer to Jesus as a man, and avoid calling him a god, in order to get as much of the Gospel into their ears as they could handle (he did believe Jesus is God)? In the middle of the book, Copan and Litwak take a break from focusing on Paul’s environment, and switch emphasis to our own environment and the bridges we can build philosophically, scientifically, historically, and culturally. Though some eschew philosophy, C.S. Lewis rightly pointed out that “we need good philosophy, if for no other reason than that bad philosophy should be answered.” Scientifically, we can affirm the Big Bang as the beginning, we can talk about the Goldilocks effect of the universe’s fine tuning for life, consciousness from nonconscious matter, design language in biology, and purposiveness. Copan and Litwak’s suggested bridge-building definition of science is “attempted objective study of the natural world/natural phenomena whose theories and explanations do not normally depart from the natural realm.” They distinguish between naturalism (how the world is only matter) and scientism (how we know the world only through the scientific method). I love their bit on Augustine on pages 44-45. Historically, we can talk about facts accepted by even skeptical scholars, including Jesus’ crucifixion under Pilate, burial in Joseph’s tomb, the tomb being found empty, there being several witnesses claiming he appeared to them after his death, the resurrection-proclaiming church emerging suddenly even in Jerusalem, and the conversions of skeptics James and Paul. Copan and Litwak go into relativism (true for you but not for me), postmodernism (no oppressive meta-narratives), emotivism (emotions over truth), pluralism (many paths to salvation/enlightenment), and syncretism (buffet style). They end the book by praising Paul for distinguishing between persons and beliefs, and complimenting the persons and addressing their false beliefs in the language of their own worldviews. They make some helpful suggestions towards evangelism and challenging the idolatries in our current cultural climate, hinting again at the promise of Imaginative Apologetics. Scattered throughout the book there are helpful tables that distinguish between worldviews, and there are thinker bios and pictures. I’ll leave all that to your imagination and recommend you read the book! This post originally appeared in EQUIPPED Vol. 1, No. 2 – Evidence for the Existence of Jesus. Cross-posted with permission of the editor. This entry was posted in Apologetics, Reviews and Interviews, The Gospel. Bookmark the permalink.